1.12/1.12.1/1.12.2 must be installed before. 02MAR10 2300 UTC - 1.12.3 has been rereleased. Please download again. Last edited by FireBird_[WINE]; 03/04/10 09:48 PM. * Added two visual themes: one for Apache and one for Hind (by GCsDriver). Don't forget to set themes=2 in EECH.INI. * Added different maxfov settings for different cockpits in EECH.INI. * Player-controllable Comanche, Apache, Blackhawk, Havoc and Hokum-B won't stand above or below surface (by W4chund). * Restored respecting of season for loaded saves. * Restored broken Alt-F3/F4 support. Last edited by Colonel_Kurtz; 03/06/10 04:55 AM. * I selected Realistic Engine Startup hoping that the ARNEH startup sounds had been fixed with this update. I still cant confirm this as with RES enabled, I cannot start HUD, or MFD's, nor Fire the APU. MFD's are live in CPG pit but startup items are still not availlable. * In the Options screen in the sound section, I only have a "software" option as my sound card is not detected(SoundMax Integrated HD Audio)that is a PCI card on my ASUS MB. Note- backup your game.cfg before trying this update. Did anybody else experiance these issues? Does this fix the missing export data to shared memory probelm that has been in all the version since 1.8.5 although it still says that is available in EECH central ? Potentially fixed. Please try again. I can say nothing about RES functionality now. Sounds control has been added. Detection has been changed. Please try again. If anyone wants a copy (of the VB6 code or just the EXEs) drop me a PM and I will zip them up and send them off. Both dials work fine on XP, however with Vista they do need a DLL dropping into one of the System folders. I will have a scout round and see if there is a Microsoft patch that installs the required DLL. The realistic start up still functions, the problem is the CTRL and ALT keys on the right side of the keyboard are disabled. The left side keys still work, although its a little awkward. Is the list above in the same order as the ini entry? Im not sure i understand xyz either. Could you give an example of how you would make sound louder with cockpit door closed please, lets say with the first value 75,20,375. Last edited by Colonel_Kurtz; 03/04/10 10:02 AM. Does this mean the missing/muted sounds are back??? "Fear is the mind killer. - Frank Herbert"
The APU, and Gear is there, The engines firing up is still barely audible if your in the Apache, in the Commanche with cockpit door open its there. The sound which you hear when inputing collective(perhaps load on rotors?) is still barely audible. Well. Let's start from the beginning. amplification = first/100 + bound(door,0,second)*third/10000. amplification = first/100. The "first" is a volume level in per cents for the sound when the door is closed. Let's assume the "second" and the "third" are positives (I doubt we want them negative). When the door is opening, the "door" is increasing, and amplification is increasing too. The "second" is a limitation of the increase, when door reaches the "second" level of opening and continues to open, amplification stops increasing. That's because "bound" limits it value by the "second". How fast amplification increases when it increases? The "third" rules it. Now, a simple example. We want a sound to have 30% when the door is closed and 120% when it is open for more than 50%. first = 30, it's easy. 30 / 100 + 50 * third / 10000 = 120 / 100 - right? Therefore amplification = 30 / 100 + bound(door, 0, 50) * 180 / 10000. And we can calculate amplification for any door's position. I hope it's clear enough? 3. How fast amplification increases when it increases? The "third" rules it. 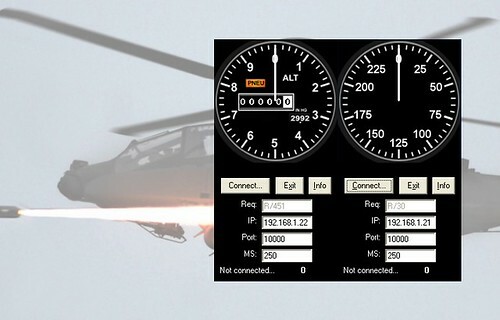 Forgive me if Im being annoying, but how do these values influence volumes levels on other aircraft apart from the Commanche and KA52 that have a cockpit door that opens? Or have I missed something again? You're not annoying in any way. Hind supports those values too. Others have their doors closed. I have 1.12.0 all mod installed but I cannot seem to find 1.12.1 can someone give me some direction? "readiness is only accomplished when the need for it is over"